Cloning a campaign allows you to quickly move through the campaign creation process by using the content of an existing campaign. The cloning process is very similar to the Add Campaign process. When you clone a campaign, the values entered on the Network & Targeting, Links, Fire & Forget™, and Ads (along with Gemini Settings if you are cloning a Gemini campaign) steps will be present. These are taken from the campaign the moment it was cloned, not from when the original campaign was created. 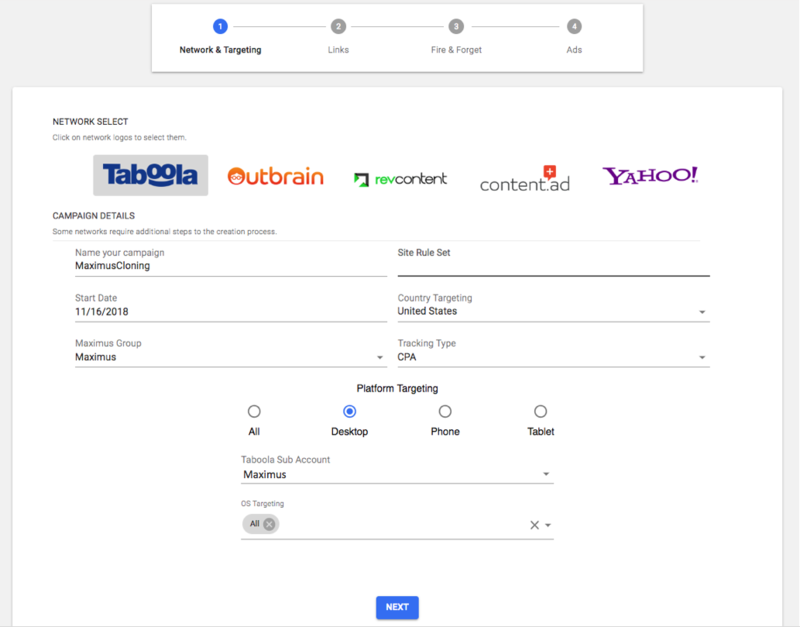 To clone a campaign, navigate to the campaign details page for that campaign by clicking on that campaign from Manage Campaigns. Once the page loads, Click Clone Campaign from the side menu. The first section in the process is Network & Targeting. Network Select - The network of the original campaign will be preselected. 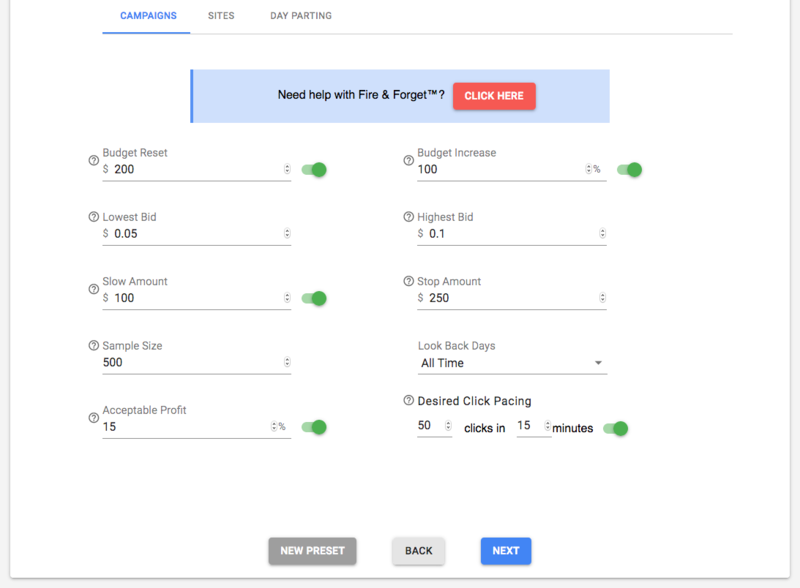 Campaigns can be cloned to the same network or to a different network. Campaign Details - All fields are filled with the information from the previous campaign. Campaign Name - The campaign name initially set will be the name of the original campaign with '_Copy' appended to the end. You can keep this or create a new name for this campaign. The landing page and weighted links from the original campaign are displayed. You can edit these links however you would like and also add additional weighted links to the campaign if you want to at this step. Budget - The budget for the cloned campaign will not copy from the original campaign and will default to $200. CPC - The CPC copied over will be the current CPC of the original campaign. All Fire & Forget™ settings from the original campaign will be loaded here. Click the tabs for 'Sites' and 'Day Parting' to view the settings on those levels. 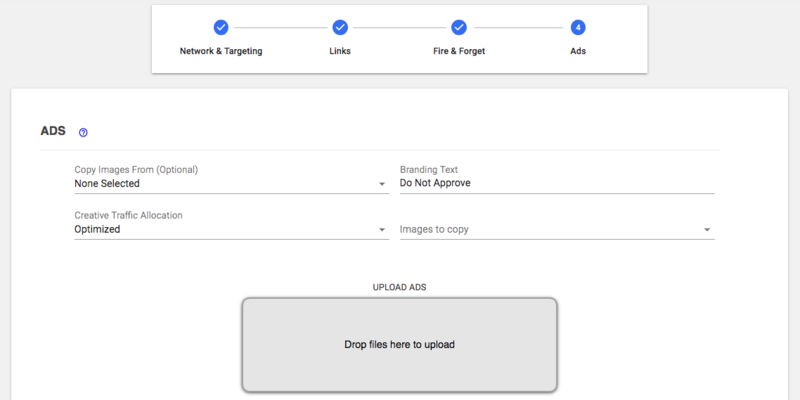 Copy Images From - This dropdown allows you to copy active images from any other active campaign on the same network. Branding Text - Branding text is the brand/category for the campaign/ads. Images To Copy - This dropdown is used to select additional images from the original campaign to clone. Up to 15 ads will initially be displayed in the 'Copied Ads' sub section and prioritized based on active status. Each additional ad selected will also be displaying in the 'Copied Ads' sub section. 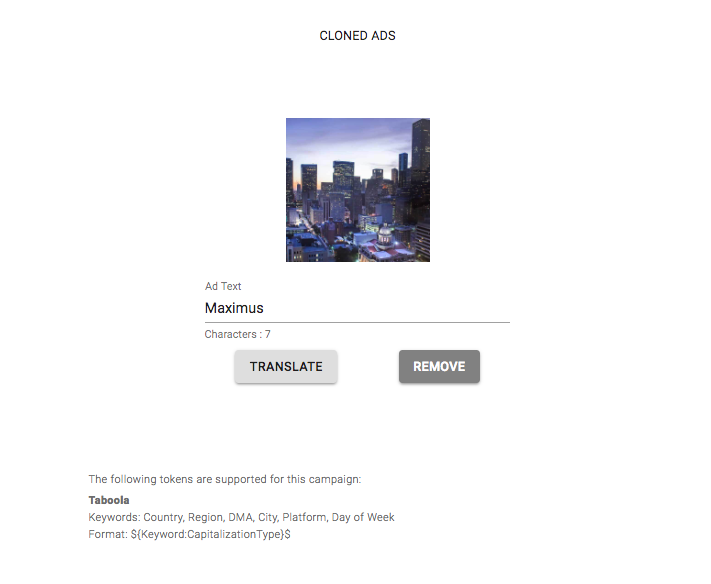 Cloned Ads - The ads shown in the copied ads section are the ads copied from the original campaign. This section will initially display up to 15 images from the original campaign. These images are prioritized by active status. Images selected from the 'Images to Copy' dropdown will also be shown in this section. If the campaign will be cloned to a different network, be sure to update the ad text to adhere to the guidelines of the new network. Click here to view the guidelines for each network. For Gemini campaigns, the cropped square image will also be copied over for the ads on the original campaign. Cloning has many uses, the most common would be copying a campaign to test out that same campaign but with different site bids, paused images, day parting settings, etc. Cloning is also used to create copies of a campaign if gets rejected from the network, to try and submit more to get approval. Cloning is very useful in optimizing a campaign. From a brand new campaign, you can have many ads and test many different campaign and site bid combinations. After a period of time you will find the best performing combinations of bids and images. At this point, cloning the campaign will start it off fresh without stats from those previously underperforming images or sites being used, while you decide not to copy over those images and start by reducing site bids or blocking sites that did not do well. This process can continue until the best few images and a handful of sites are left on the final cloned campaign. From here Fire & Forget™ will essentially allow the campaign to scale with the you having the most minimal involvement possible.